Interested in Getting a Red Bike? For availability call (608)251-1663 or check out the Red Bike Project’s Twitter feed. Every year the Red Bike Project of Madison starts in the spring (usually around tax day). 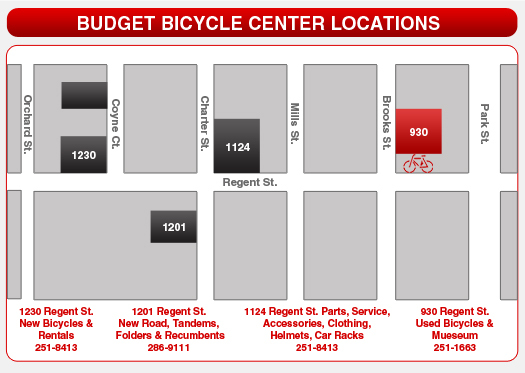 You can come to Budget Bicycle Center Used located at 930 Regent Street to check out a Red Bike. Regular business hours are M-F: 9am-9pm Sat: 9am-7pm Sun: 10am-7pm. An imprint of your credit card for an authorization of $100 is required as a deposit- if you do not return the Red Bike before your due date you will be charged the $100 deposit. Locks are provided if you don’t already have your own. Red Bikes are checked out on a first-come-first-serve policy so you cannot reserve a Red Bike. If you are not using a Red Bike you checked out, please return it as demand always exceeds supply. You must present a valid credit card for the authorization ($100 per bike). You must ride at your own risk. Bicycle helmets and lights are strongly encouraged. You must obey the rules of the road. You are responsible for your Red Bike. Keep it locked up and treat it well. You must keep the tires inflated. Check tire pressure every week. You must bring the bike in asap for no charge maintenance when necessary. The Red Bike must be returned to the Budget Bicycle Center Used store by your due date; the latest possible being November 20th. When you return the Red Bike and lock your deposit will be returned to you. Come in to the Budget Bicycle Center Used store on Regent Street and we will find you a properly sized Red Bike. 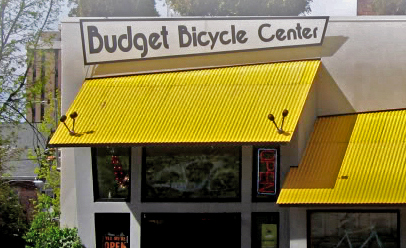 If anything goes wrong with the bike, bring it back to Budget Bicycle Center Used. Repairs will be provided free of charge. Always make sure you lock up your Red Bike and ride safely!